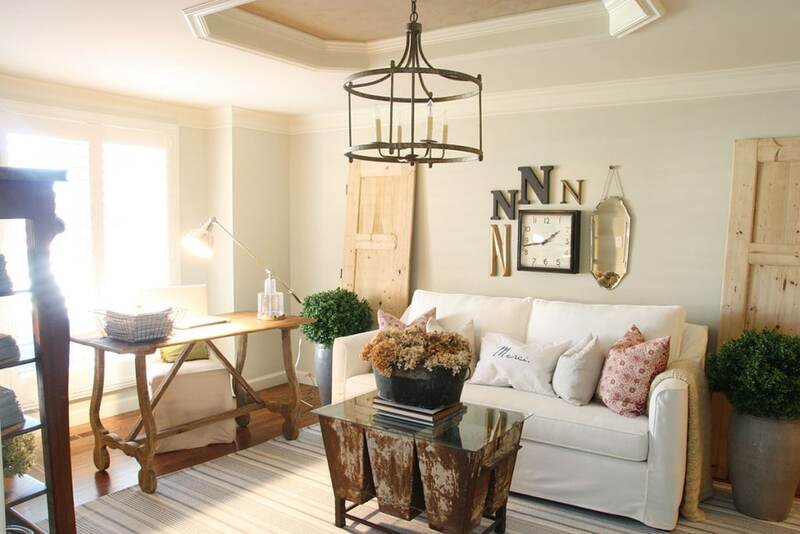 A few weeks ago, I had the opportunity to shoot a stunning neutral home tour in Omaha along with my friend Mandy. 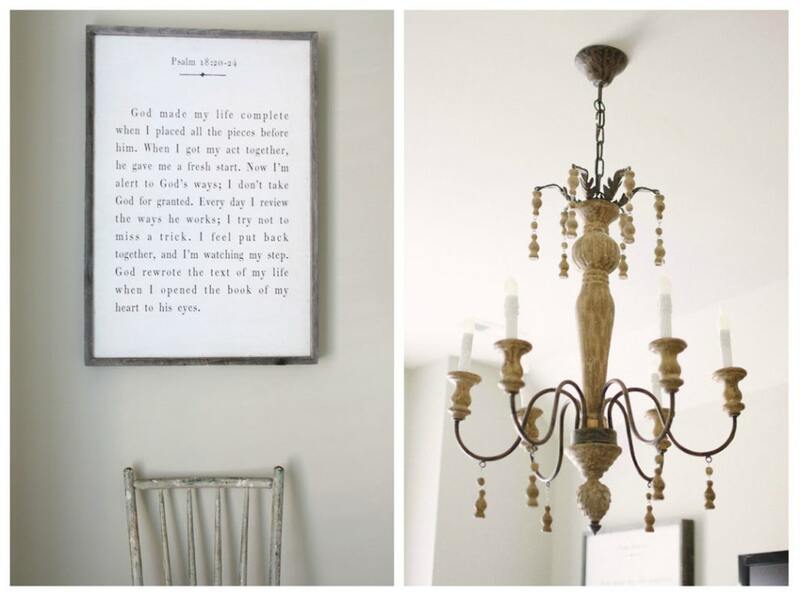 The home belongs to Nancy, owner of a gorgeous home decor store Pearson & Company (stores are located in both Omaha and Scottsdale). I have long admired Nancy’s work in our local Street of Dreams and while perusing her home decor store (if you’re local and haven’t been before – it’s a must)! 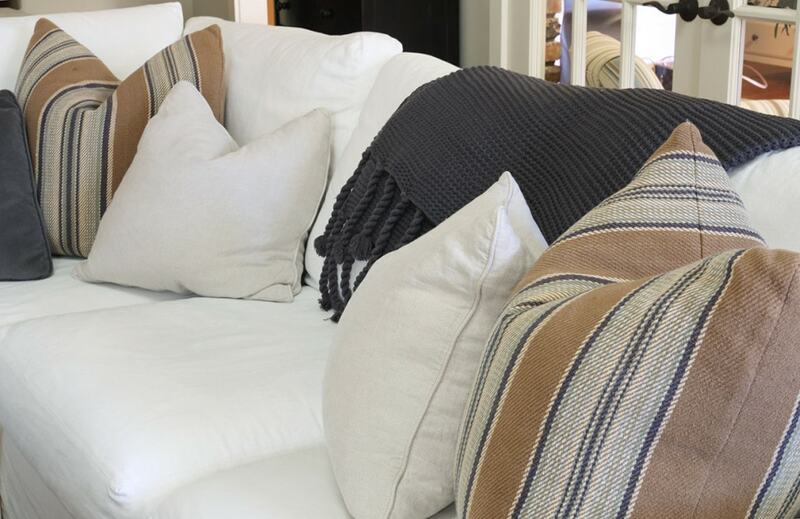 Nancy describes her style as “Relaxed, cottage comfort with a “Hampton’s attitude” right here in the Midwest”. Perfect, right? I actually told her I felt like I had walked onto the set of a Nancy Meyers movie (think: Something’s Gotta Give, The Holiday and/or It’s Complicated). Nearly everything in Nancy’s home comes from her store. I’ve included a source list (and paint colors!) at the end of this post, but Pearson & Company can also be contacted directly for any items. For those that aren’t local, I’ve tried to source a few of the items as well. Okay, enough talk! On to the pretty pictures! 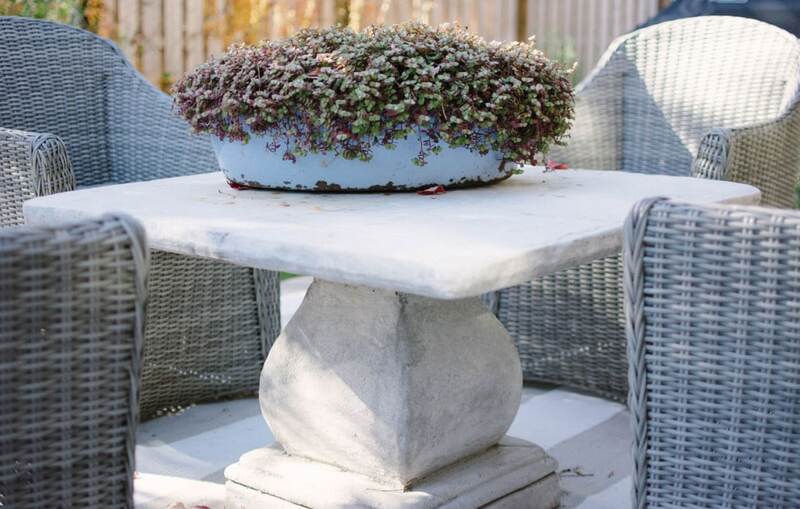 The home was built in the early 1980’s, but I think you’ll quickly see that Nancy and her husband have done an incredible job of removing the 80’s vibe from their home – both on the exterior and interior. Upon walking in the front door, you’re greeted with this beautiful view! The living room is so cozy and comfy feeling. Since moving in, Nancy had the brick fireplace removed and this beautiful mantle built in it’s place. 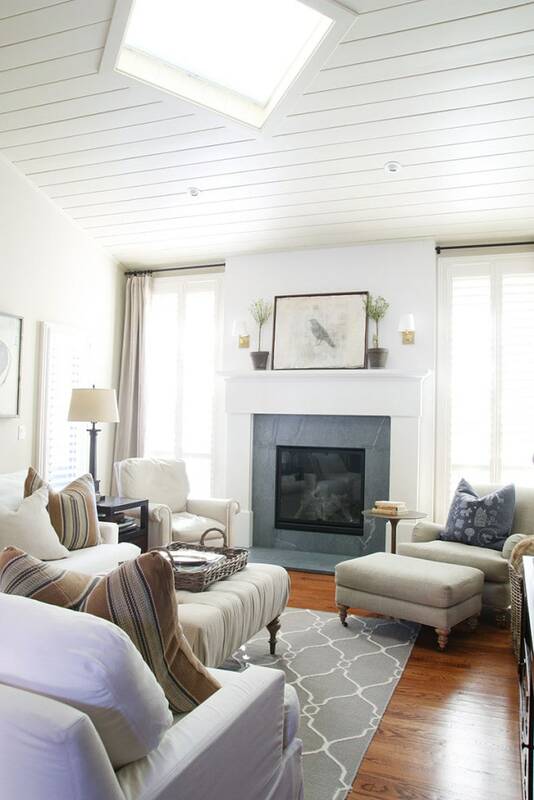 The ceilings were raw wood and she had them painted and they couldn’t be more beautiful! Although most of her furniture is white (or very light) she swears by here slip-covered LEE Industries furniture (more info in the sources section at the end of this post). The subtle trellis rug has been a long-time favorite of mine and I love it here in the gray version! 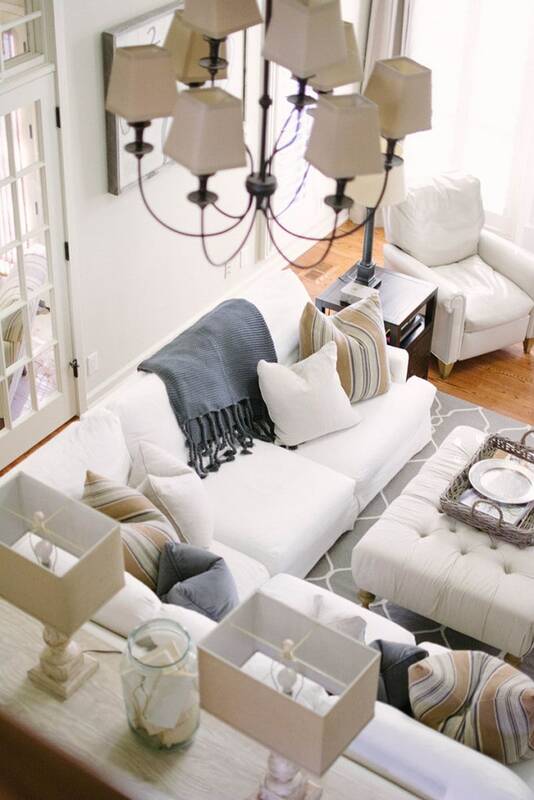 I can’t get over the combo of those gorgeous striped pillows and the neutral furniture! 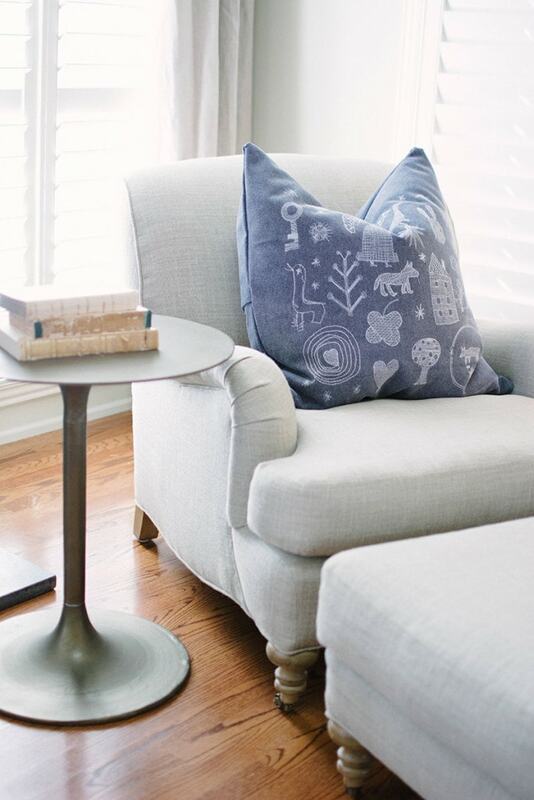 How darling is the artwork behind the sofa?! 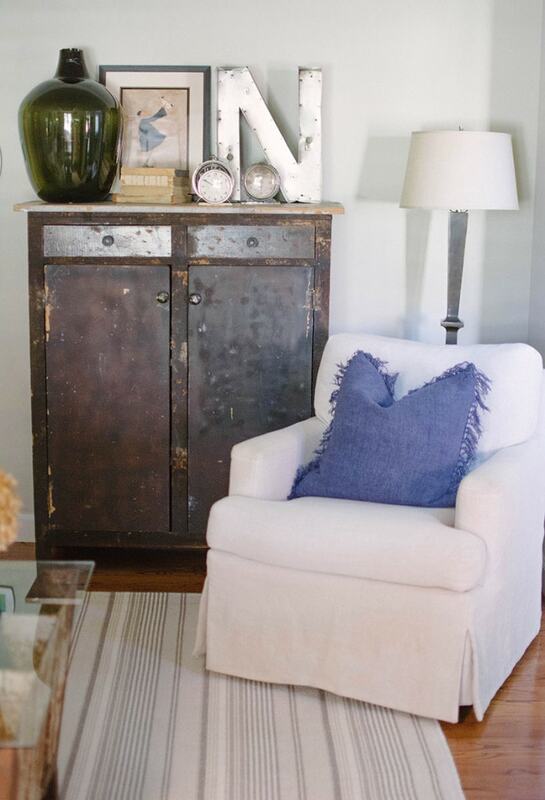 The front room, to the left of the entryway has both feminine and rustic touches. 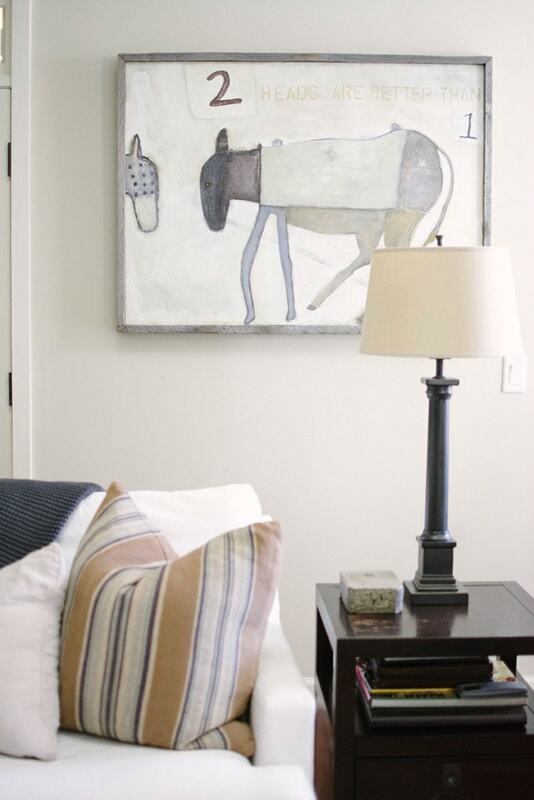 She used another striped Dash & Albert rug that I’m in love with here, as well! 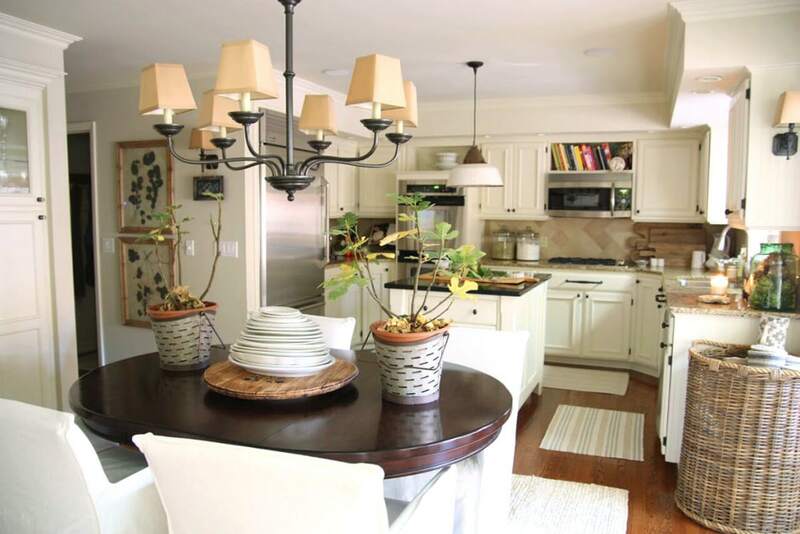 The kitchen and breakfast nook are off of the living room and it is such a warm and inviting space. 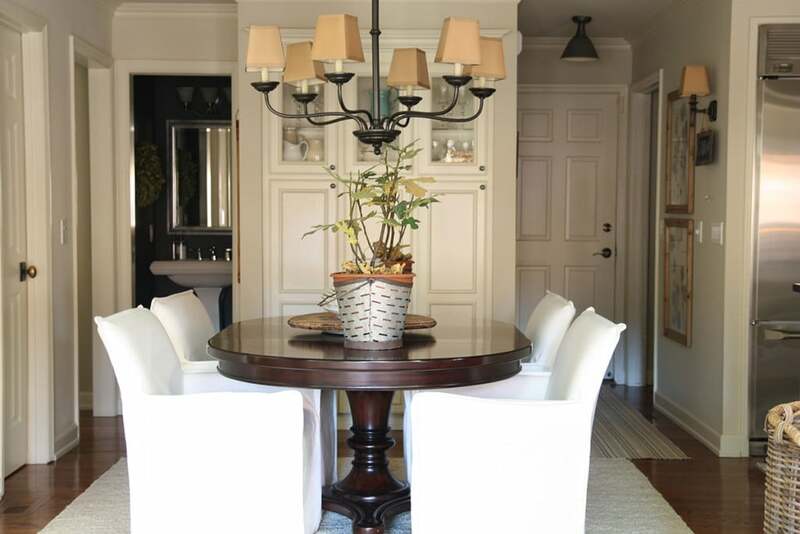 I have a mad crush on the slip covered LEE Industries dining chairs (they are on casters and roll around so easily even on the rug)! Again, the slipcovers are completely washable, so she doesn’t worry about people eating on their pristine surface (even her grandchildren)! 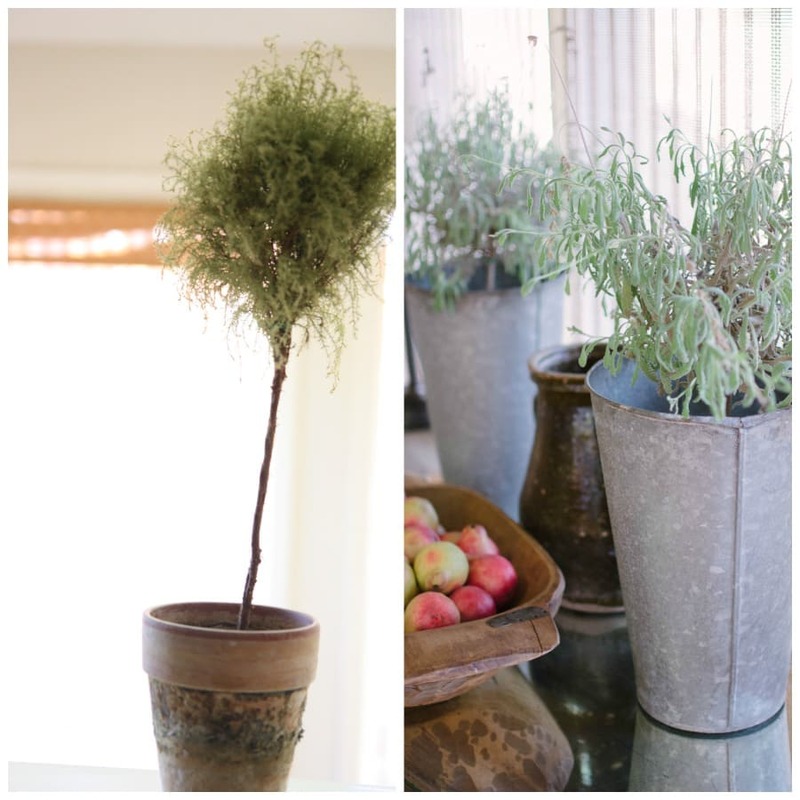 I love the idea of using olive buckets to hold your plants! 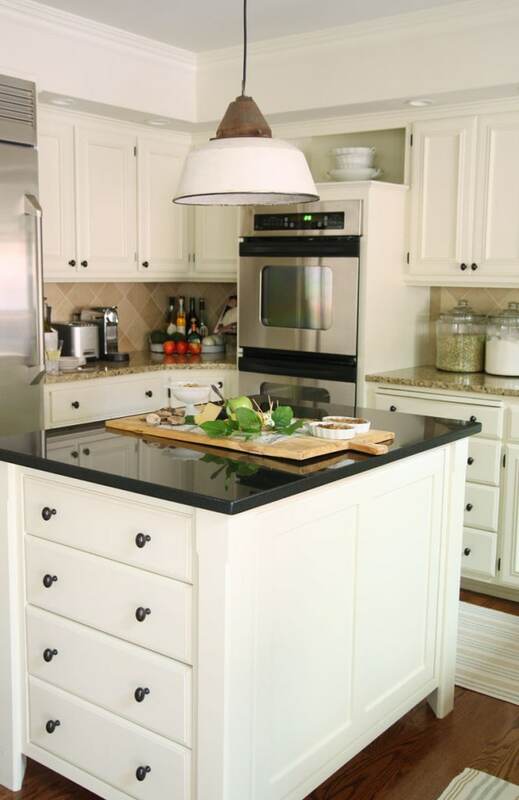 The kitchen cabinets are all original to the home (they are oak). 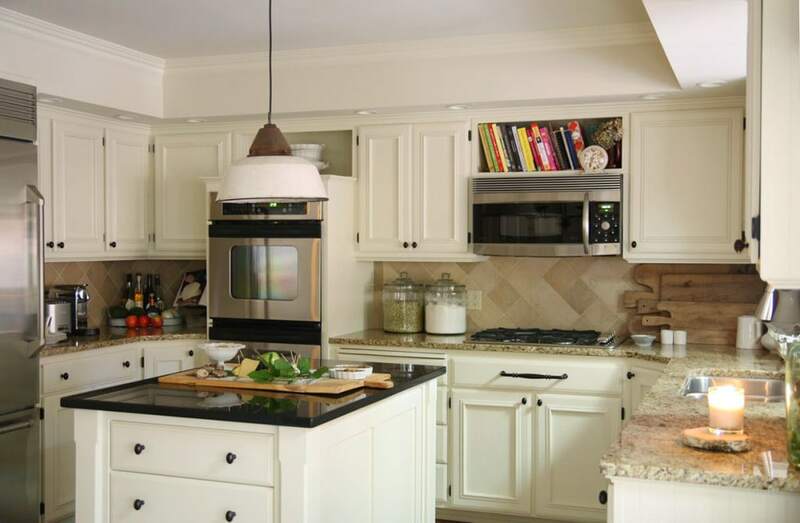 With other renovation and remodeling costs, Nancy opted to have the cabinets skim-coated (to remove the grain) and then painted, rather than doing a complete overhaul of the space. This is a great example of working with what you have. The results are beautiful! 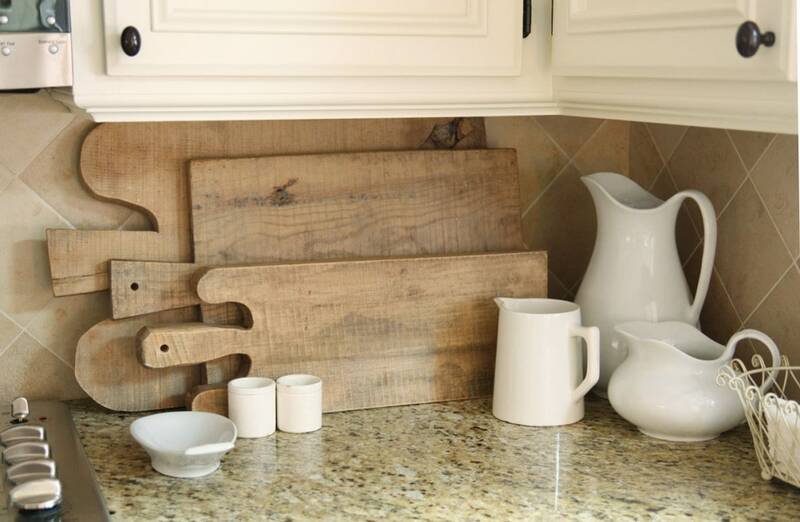 Here collection of French antique bread boards is to die for! You can also catch a glimpse of more cute Dash & Albert striped rugs! I love the color combo on these! 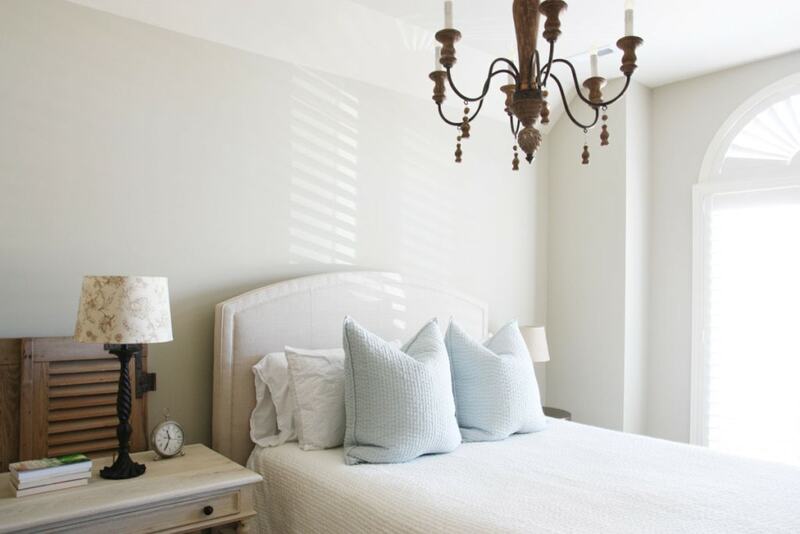 Moving upstairs to the guest room, you’ll find a serene and peaceful space. 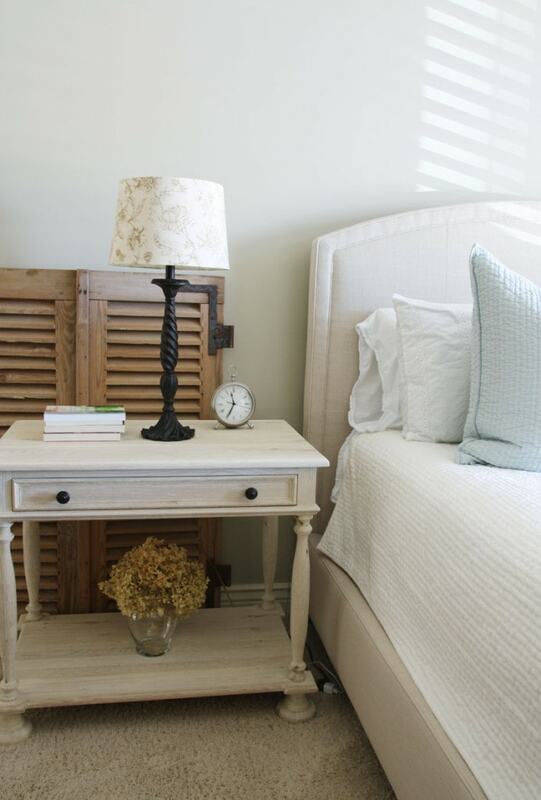 The gorgeous Pine Cone Hill bedding is simple, yet adds the perfect amount of texture to the room. You can find similar artwork from the same brand here. 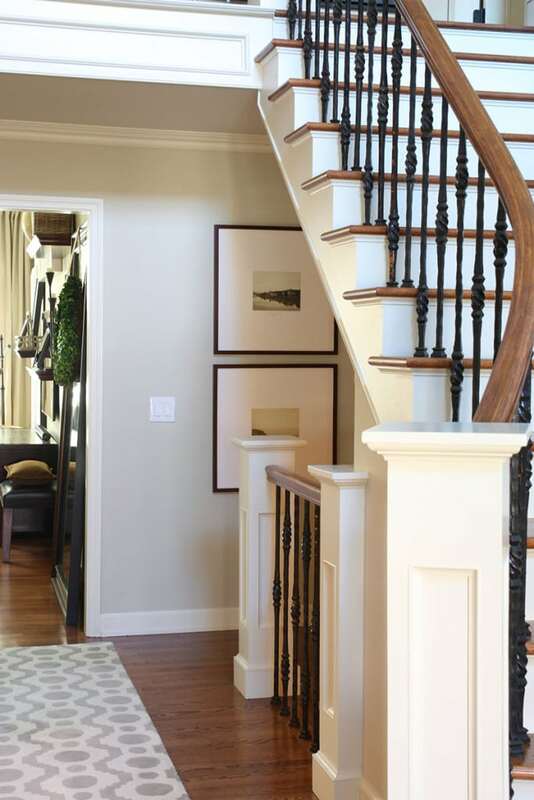 Heading down the hallway to go back downstairs, the view of the living room below is so beautiful. 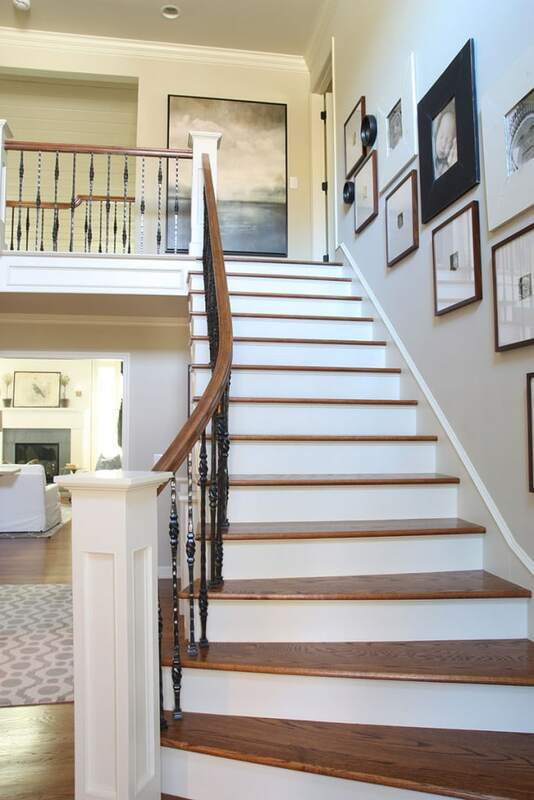 I also obsessed over the navy herringbone runner and oversized abstract art in the upstairs hallway. 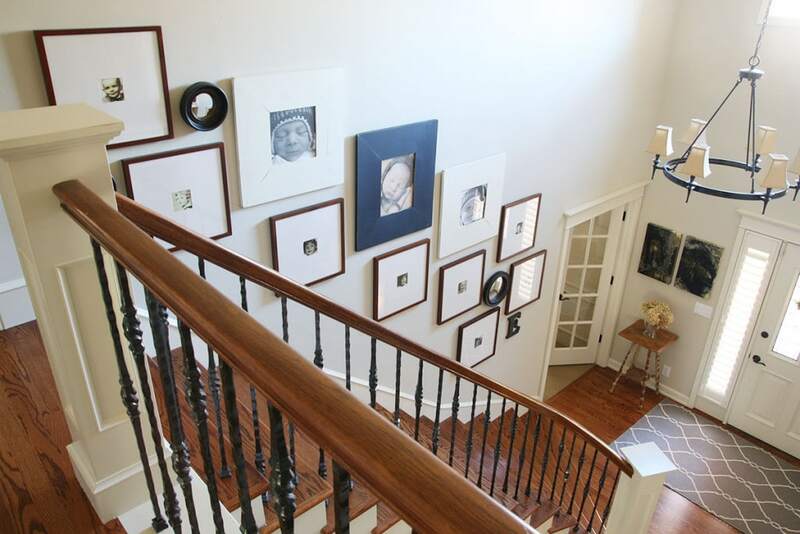 Not to mention, the framed family portraits lining the staircase were charming and so beautifully arranged! 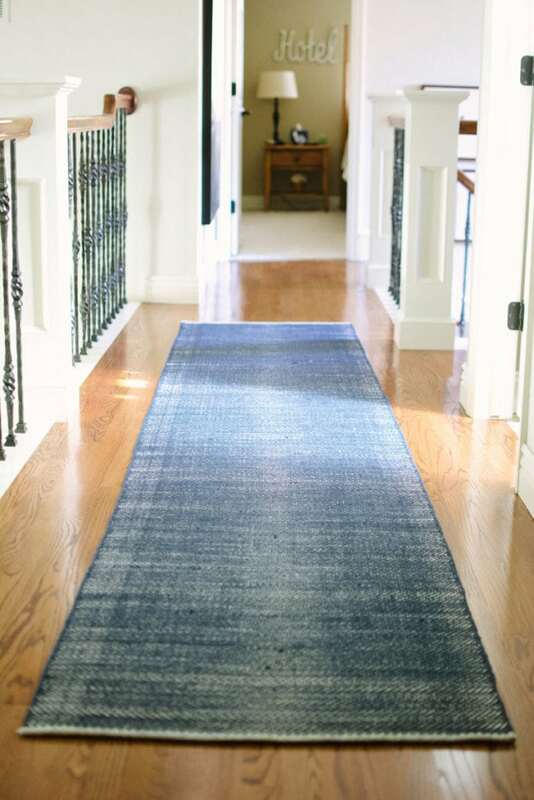 I was so obsessed with this navy herringbone runner, I’ve since bought one for our home! I love that it comes in multiple lengths, sizes and colors! 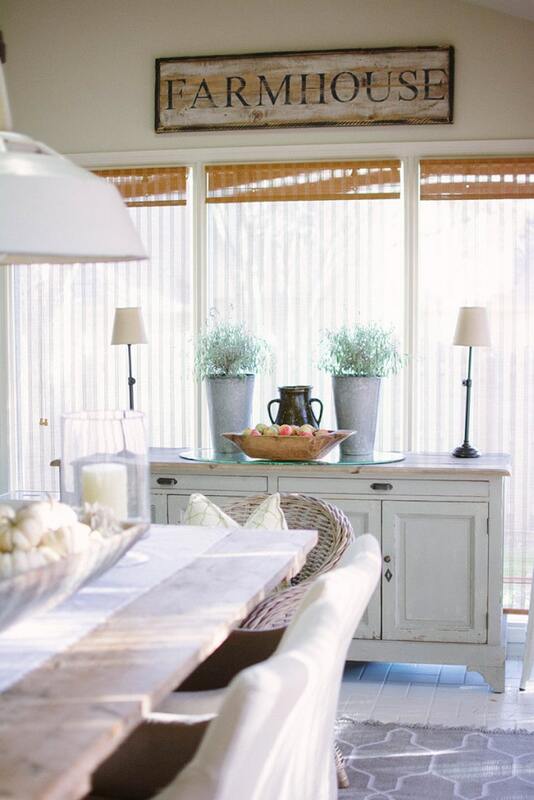 Just off the kitchen and breakfast nook is this adorable sunroom/dining room. 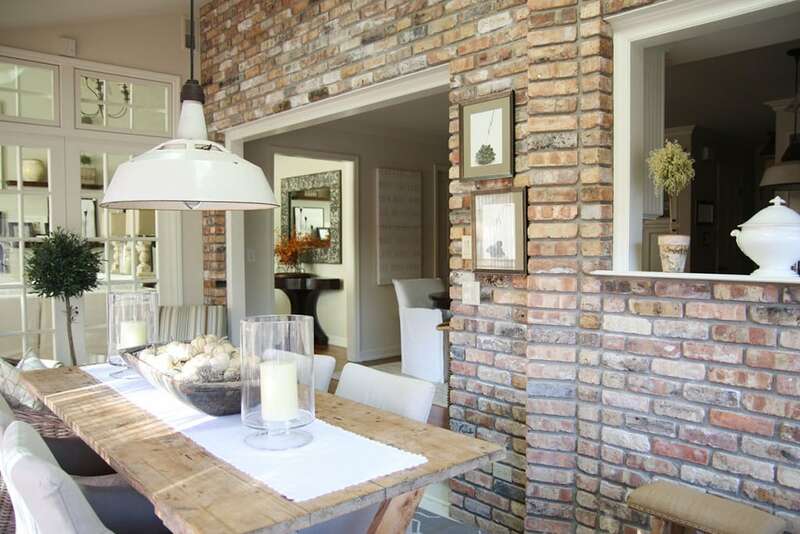 It was original to the house, but when the builder designed it, he added exterior brick on the wall that connects to the kitchen. This unique feature adds both character and the appearance that it was an add-on to the home. Nancy uses the space as her more formal dining area. Nancy didn’t want us to shoot her back patio, which is just outside of the sun room, because she thought it was too dirty from the fall leaves. But Mandy and I agreed it was perfection and was too pretty of a space not to share! 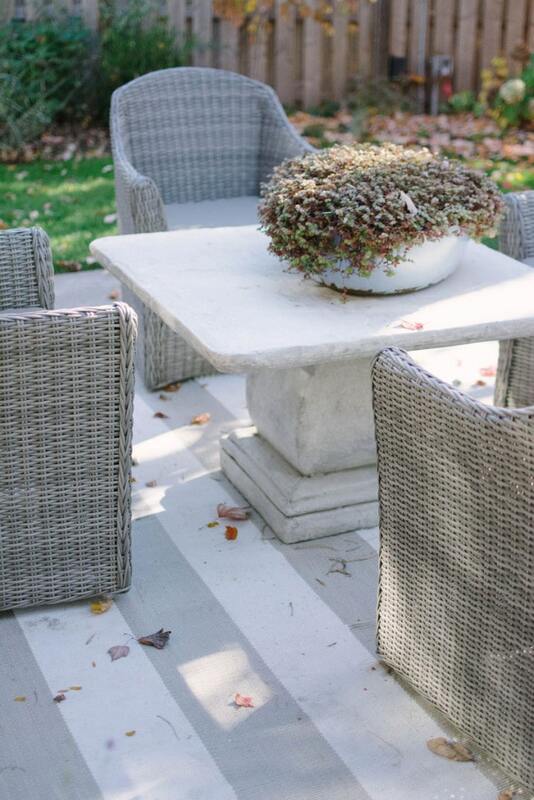 I’m in love with the use of this indoor/outdoor gray & white striped rug! I hope you loved this home tour as much as I did! A big thank you goes out to my friend and second photographer, Mandy, as well as to Monica and Nancy at Pearson & Company for partnering with me on this post. 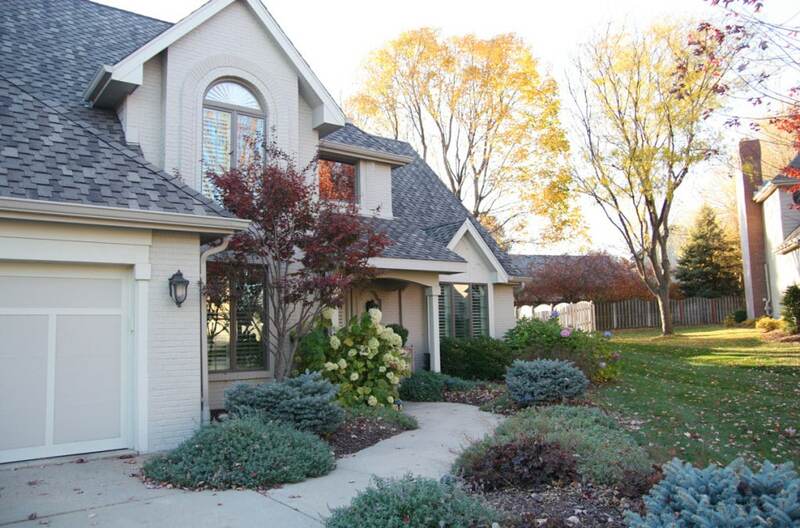 I think we can all agree that Nancy’s home is stunning! I don’t know if Mandy and I had more fun touring and taking pictures of the home or sharing laughs afterwards over wine with Nancy and Monica (the mini cheese ball and cookies were provided by Nancy’s friend Paula, of Creme de la Creme and were too good to stay away from)! We are hoping to all partner again to share some of their client home tours down the road! 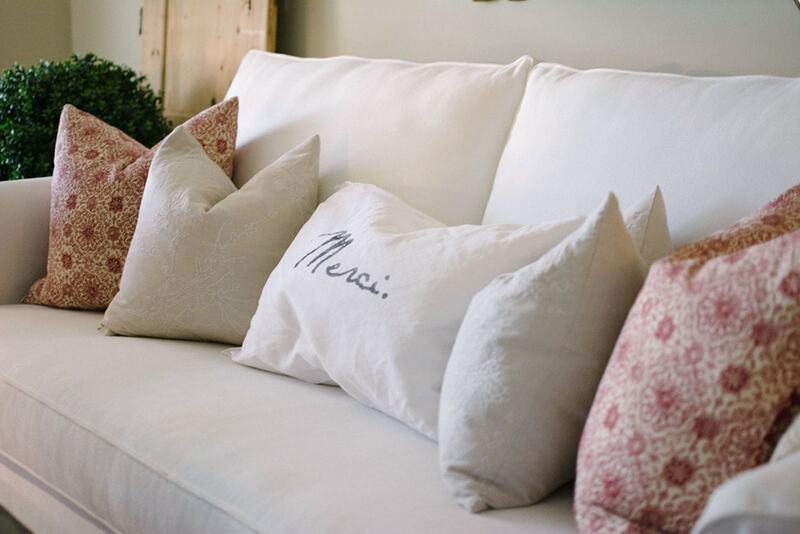 If you’re local and haven’t checked out Pearson & Company, be sure to stop in! You can find them in the Shoppes at Legacy at 16939 Wright Plaza, Suite 143 in Omaha. If you have any other sourcing questions, feel free to leave a comment on this post or call the store directly at 402.932.5999. Following are all of the sources available. And because I love you all so, and knew that you would ask, I also got a list of the paint colors from Nancy. All interior wall paint is in a flat finish. 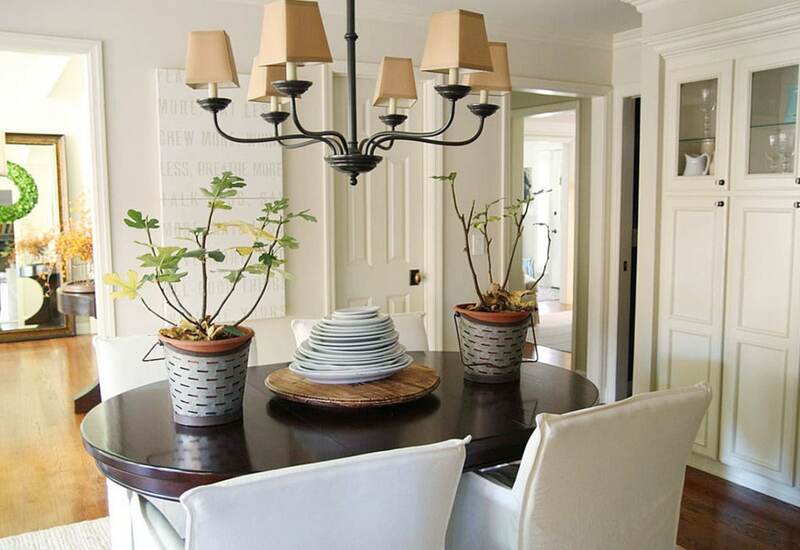 What a beautiful home and thank you for the extensive list of sources! Lee Industries makes some great furniture. I often stop in a local boutique that carries them and I always sit on all their comfy chairs. Thanks for the lovely tour! Thanks for the tour of this beautiful home! Loved it! What a gorgeous home, Sarah!!! Such a lovely home! Bright and cozy! Thank you for sharing these tours Sara! Love reading these kinds of posts! What a beautiful home! Could I get source info on the console/sofa table as well as the nightstand? We carry this line in our store. Please call (402) 932-5999 or e-mail [email protected] for pricing and availability. Thank you for your interest! These are some of our favorite pieces. This home is SO pretty! 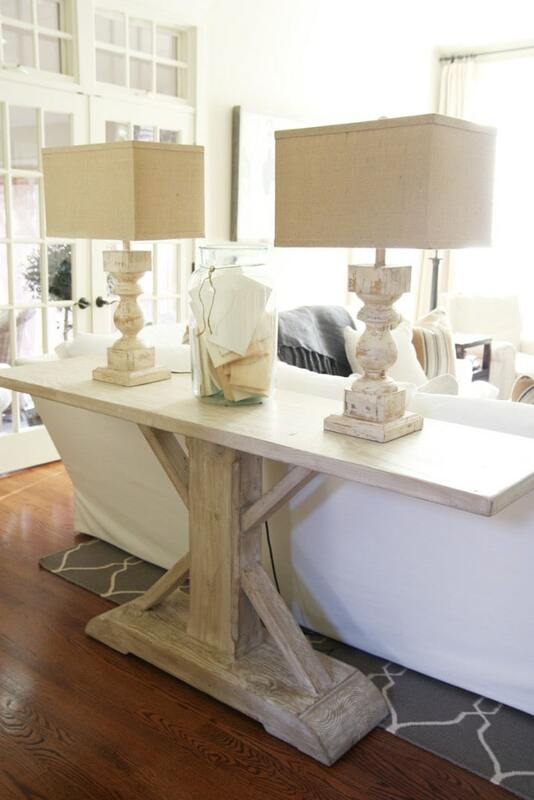 Such a perfect blend of old and new, rustic and chic. 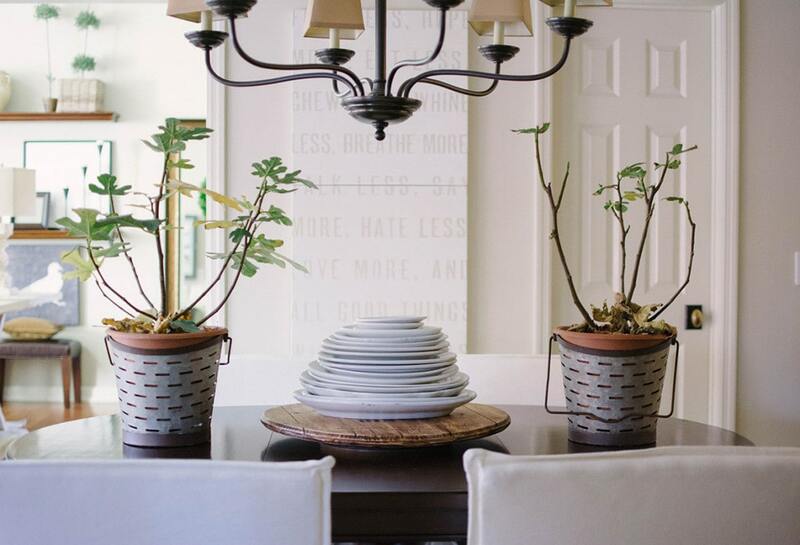 I love the artwork on the walls, and the neutral palette. Gorgeous! Beyond gorgeous! 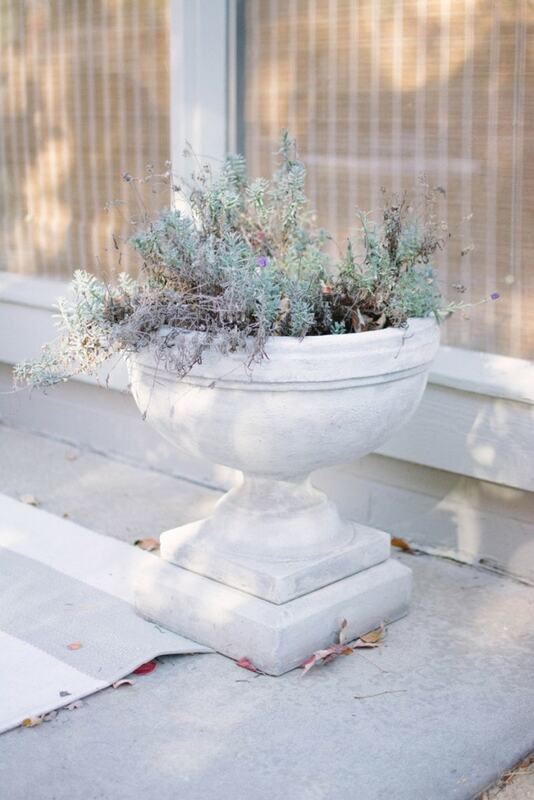 The entryway is so beautiful and I agree the patio with the fall leaves is perfection! So this is interesting – I’m normally a bright color person, but I REALLY love the neutrals! This is such a gorgeous home! What a gorgeous home!! 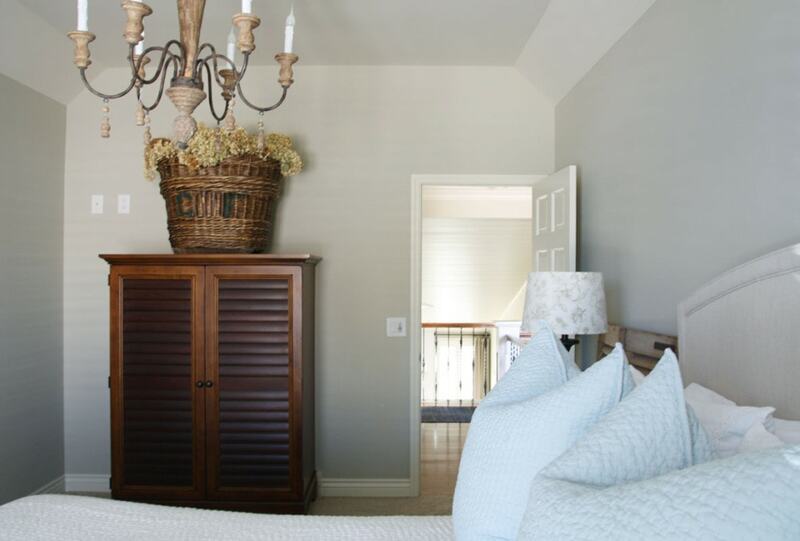 I love all of the natural light and the airy cheerful rooms! Such a beautiful, serene home! Gorgeous home! One thing I didn’t see listed was the sources for the lighting – do you have any of those? 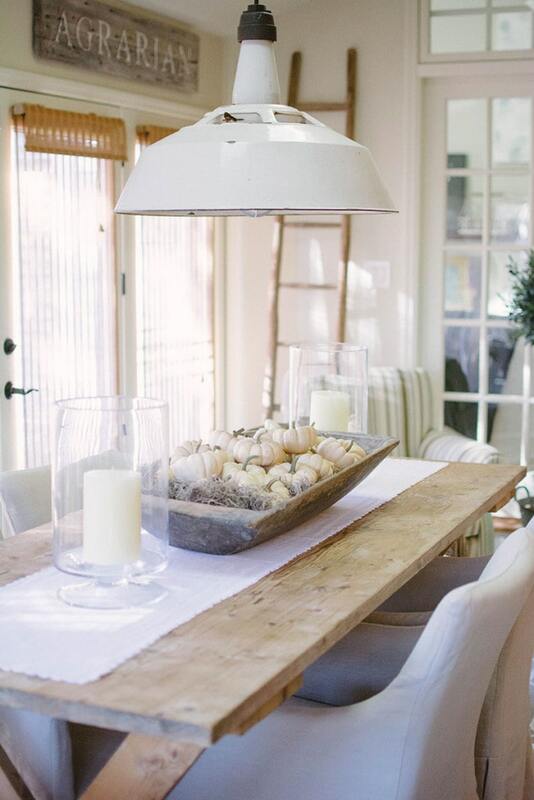 I love the chandelier over the kitchen table – stunning! All of it, really. Thanks for sharing! I walked into her store in Omaha soo many times and the experience every time. She has a beautiful home aswell. Thanks so much for Sharing. So gorgeous!!!! 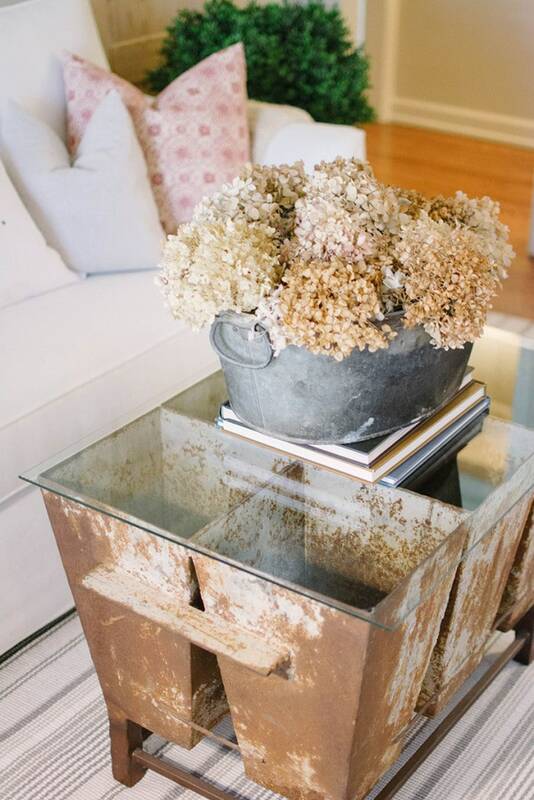 Every last inch……makes me want to move and start from scratch with my decor. Thanks so much for posting! They would be perfect for my living room! 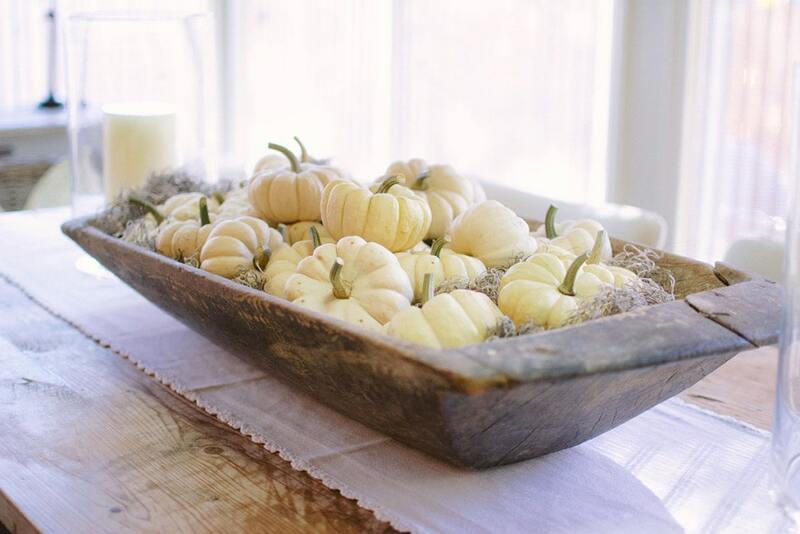 Unfortunately I believe they are several years old from Pottery Barn so they are no longer available. They’re so beautiful though! 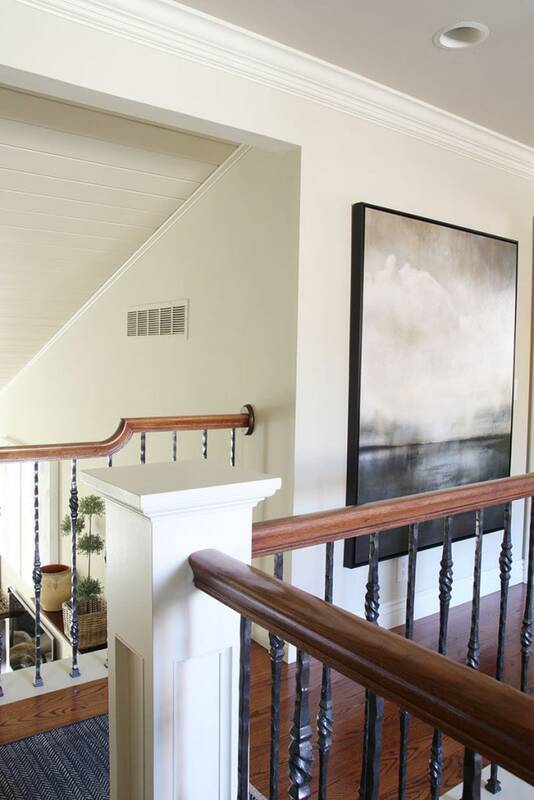 The link to the large abstract piece of art in the upstairs hallway is incorrect. Do you know where it was purchased …. it’s so beautiful. It was ordered through Pearson & Company. Unfortunately I do not know the brand name but if you contact them, they may be able to order it for you!